January 2011 – Concurrent Technologies announces the first 3U OpenVPX™ high performance embedded Single Board Computer featuring the 2nd generation Intel® Core™ processor and Intel® 6 series chipsets from the Intel® embedded roadmap. The TR 80x/39x features the enhanced processing and graphics performance of the quad-core Intel® Core™ i7-2715QE processor and the dual-core Intel® Core™ i5-2515E processor whilst maintaining the power consumption of the previous Intel® Core™ processors. Applications for the TR 80x/39 are expected in real-time, military embedded, aerospace and transportation systems for data acquisition, control systems and video signal processing. 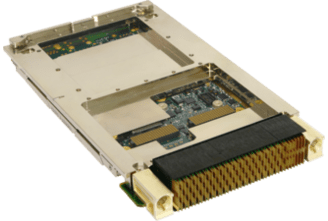 The TR 80x/39x is a 3U OpenVPX™ processor board providing support for quad-core or dual core 2nd generation Intel® Core™ processors, up to 8Gbyte of ECC DDR3 SDRAM, configurable PCI Express® fabric interface supporting 1 x8, 2 x4, 1 x4 + 1 x4 at Gen 1 or Gen 2 data rates, dual Gigabit Ethernet or dual 1000Base-BX channels, dual SATA600, single XMC slot, serial RS232/422/485 port, dual USB 2.0 ports, independent VGA and display port all in a 3U VPX form factor. The Intel® Core™ microarchitecture virtually doubles graphics performance of previous architectures and when complimented by support for Intel® Turbo Boost Technology capabilities and media acceleration, the TR 80x/39x Single Board Computer offers cutting edge technology for security, transportation, military and embedded systems. Operating systems currently supported for the release of the TR 80x/39x are Windows® 7, Windows® XP, Windows® Embedded Standard 7, Linux® and VxWorks®. The TR 80x/39x is available in three temperature grades; 0°C to +55°C (N-Series), -25°C to +70°C (E-Series), -40°C to +85°C (K-Series). VPX-REDI Type 2 Conduction-Cooled VITA 47 Class CC4 -40°C to +85°C (RCT – Series).